I chose the wrong paint color again. 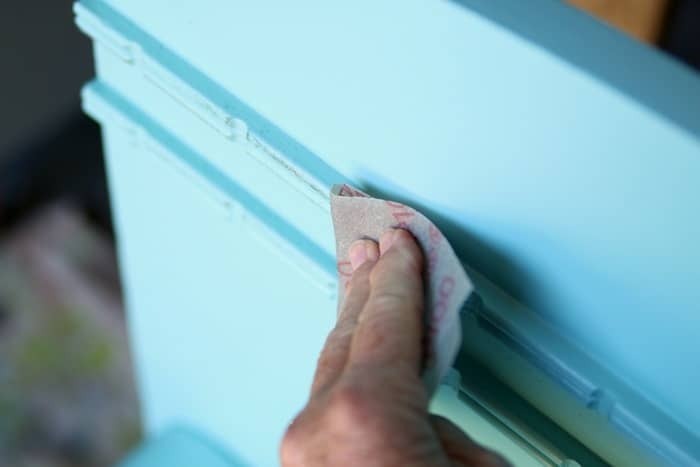 Choosing the right paint color is sometimes the hardest part of a furniture makeover. I got it right the second time. This is the headboard bench the JTS and I put together a few weeks ago. I think it turned out great. 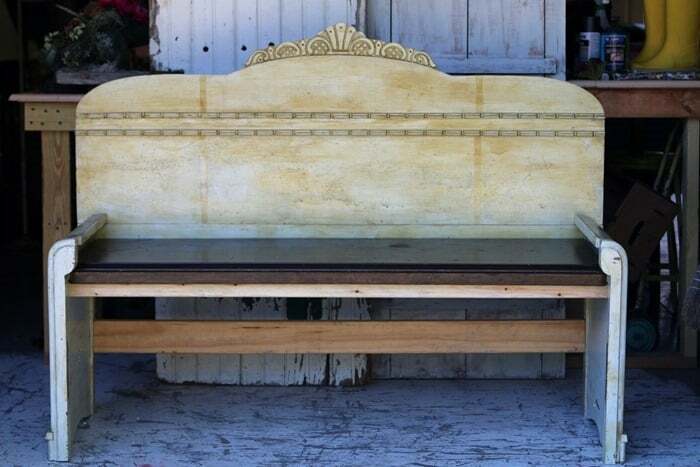 We had a few issues but this is the first headboard bench we ever attempted. I have another headboard and footboard that we can turn into a bench. I haven’t broke the news to the JTS yet. The vintage bed was a full or double as they called them in the old days. The bench ended up being about 56 inches long. 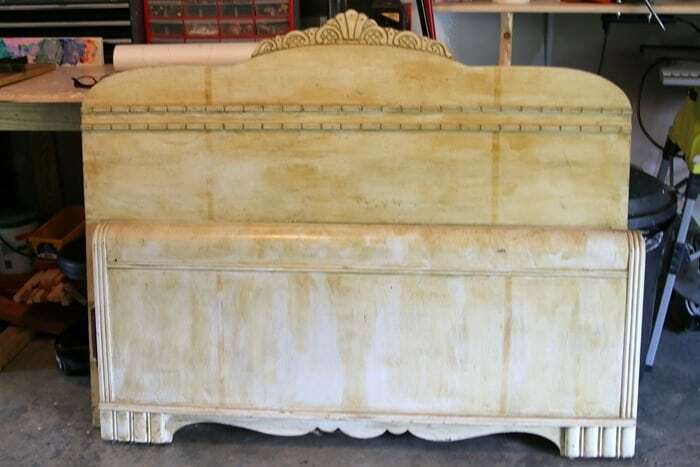 The bed had a blond finish and really pretty carved wood details. We put the bench together over a few days. Working on it when we had time. 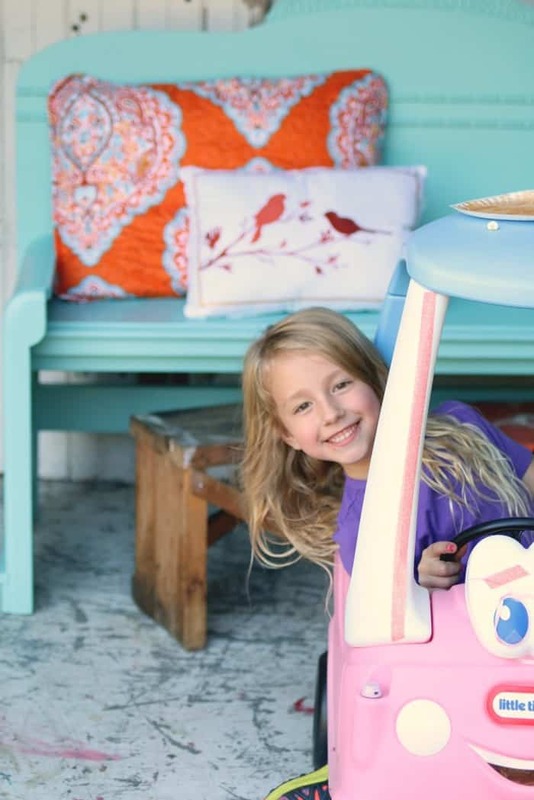 I know this project is not for beginning diyer’s but some of you may want to attempt it. The project was a lot of fun. You can see how we but it together here….DIY Headboard Bench. 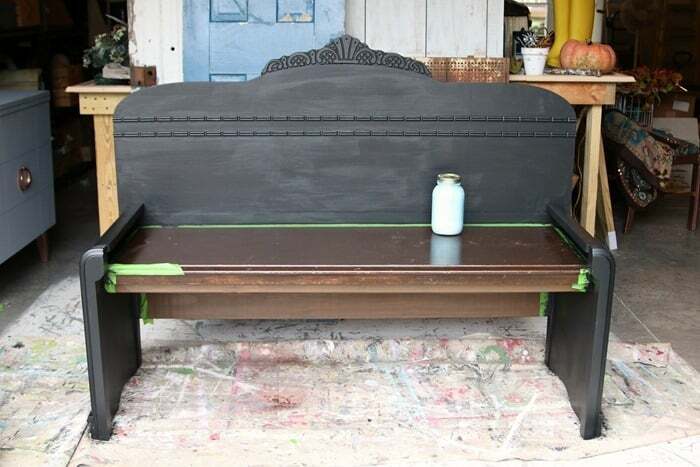 My original plan was to paint the bench black and distress all those lovely details. I planned to leave the brown wood reclaimed table top as is. I started painting then stained the unfinished wood braces to match the bench seat. Not loving the look. I was visiting in Arkansas just after I posted the bench build and my sister gave me her opinion on the bench color. She felt the same way I did about the black and the stained wood. After talking it over we both came to the conclusion that the bench should be a different color and the same color all over. Thanks little sis. I pulled a jar of turquoise paint I mixed up myself from the paint shelf and went to work. After two coats of paint I was satisfied and moved on to distressing the paint. I started on the headboard details distressing the paint by hand with 100 grit flexible sandpaper. I stepped back to look at the distressing and didn’t like it at all. The black paint showing through just made the paint look dirty and the blonde finish showing through looked like raw wood. I pulled out the paint and a paint brush and painted over the distressing. It looks much better not distressed. The headboard and footboard were not perfect. There were little dings and imperfections but the overall look works. Miss Sofi couldn’t help but get in the photos. When I try to take pictures of her she either makes funny faces or hides her face. As sure as I’m trying to take photos of a project she wants in. I don’t mind at all. I love seeing that smiling face. So what do you think? 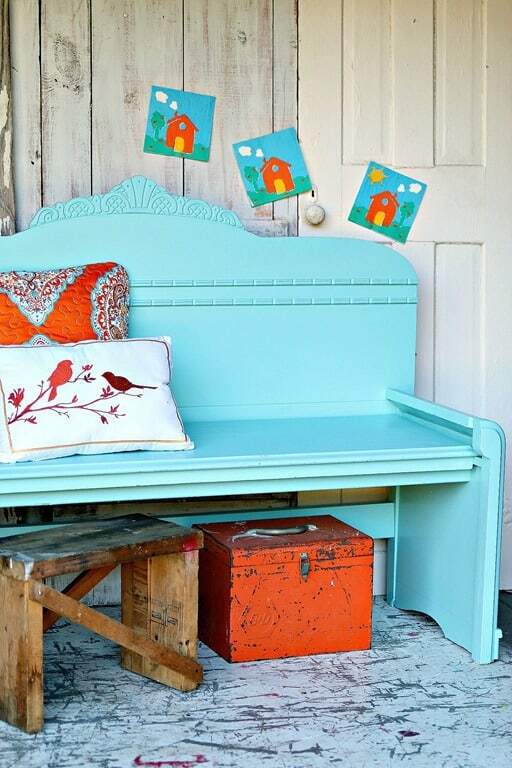 If you don’t want to attempt the bench build you might find one to paint and make your own. I’m such a fan of the color I mixed from leftover paints I plan to paint a sample board and have my own paint mixed at the hardware store. I’ll share the color code once it’s mixed. You can also find this project at RYOBI NATION. Love the colour – so bright and happy! Gorgeous as is! Love it! I love the second color. It pops, and really draws your eyes to the details on the bench. Great job. 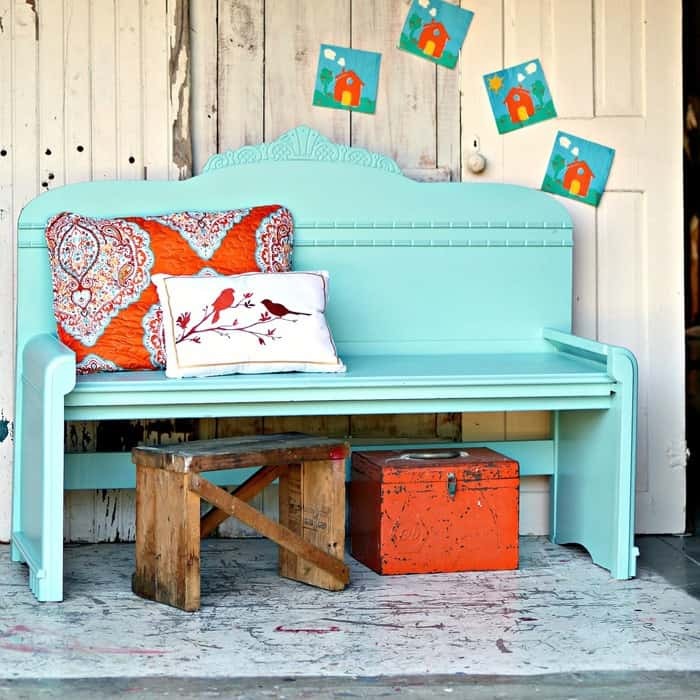 I love the color and not every piece needs to be distressed. I don’t think the bench needs another thing. It looks gorgeous. I like the turquoise much better than the black. 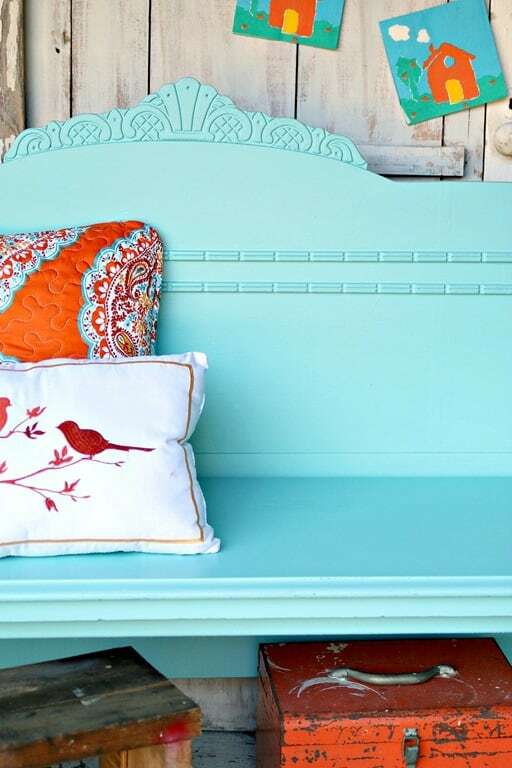 The pillows and all their orange color set off the turquoise just right. It’s beautiful! Keeping it on the porch? Kathy that is FabYouLust! I love it! And the styling in the firs picture is so fun that I stared at it for like 5 minutes! I love both! 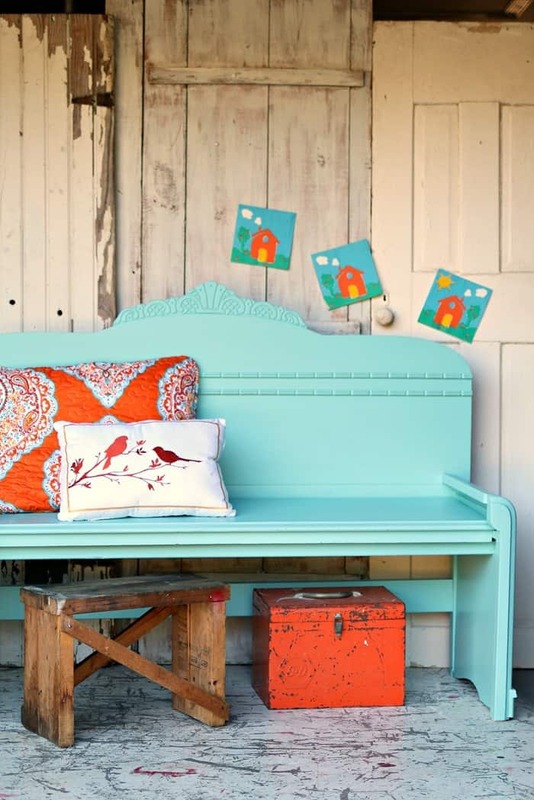 Beautiful bench! I LOVE IT! Just pinned it! I Jove turquoise, one of my favorite colors and for me will never go out of style. Beautifully done bench. Love the bench & the orange accents of the pillows & the box underneath are perfect. Thanks Chris. The pillows are from the bed in the “granddaughters” bedroom! The bench is STUNNING! I adore the color! The orange pillow makes it pop! Thanks for sharing all your AMAZING projects! That bench sure is purty! The color is great, and I love how the orange just seems to belong with it. Thank you Fonda. I love orange and turquoise together. I stole the pillows from the “granddaughters” bed, lol. Gorgeous, leave it just as is! 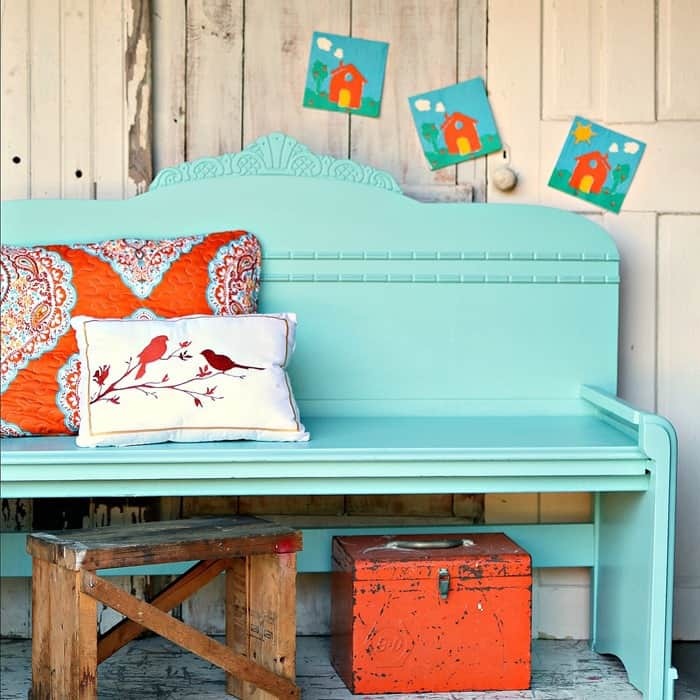 while I think painting the bench is better, I am not a fan of turquoise-not that much any way. Absolutely beautiful! Leave it as you have it. If I didn’t live so far away, Southern California, I would buy it right this minute. Fun and fresh!! Not everything has to be highlighted or distressed!! You ROCK! Thank you Sally! So sweet. I love the color! What about using a white wax to highlight the carving? It wouldn’t look muddy/dirty, but it would accent it. But….if it was me, I would probably leave it. I would end up hating it because it was too much work! I love your style! Just love this gorgeous color, beautiful job. Yep, it’s an eye catching beauty in the two-tone. No matter do over’s are great fun. Its a match for any decor or color scheme. The turquoise was nice too but the color limited it’s setting maybe making it less marketable. You turned it into a winner. That’s our Cathy!! Beautiful. Love the transformation into a bench, the color, and the accent color of the accessories and pillow designs. Glad you included your happy little girl in the picture. I often don’t want to see antiques painted but with the mixed materials and the beautiful color, it is so pretty. 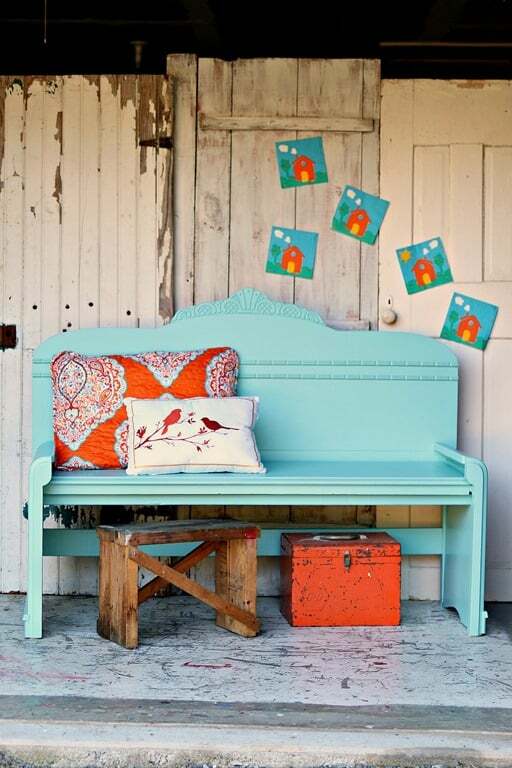 Hi Kathy, I adore the bench, the turquoise color and Miss Sofi’s photobombing sweet face. The bench needs a pop of something… at least in my vision. Soft gilding on highlights? Soft white on highlights? It’s too pretty to leave so plain.